In my previous post in this series I reviewed institutional and environmental developments during the 1960s, a much more positivistic time when institutional structures and development strategies were reconfigured according to the framework provided in Kim Il-sung’s “Theses on the Socialist Rural Question in our Country” (1964). “The Rural Theses” laid the ground for much of the development approach and production this author has spent his doctorate reviewing, and were vital to goal setting with the fields of tidal reclamation and forestry management. Examining such examples of positive institutional development is of course interesting from our current perspective of studying the avowedly positivistic Sepho Grasslands Reclamation project. However it is important to bear in mind that while Sepho represents something new, “dynamic” and “vigorous,” it also represents the seeming abandonment of one form of reclamation for another. It would therefore be useful to examine similar moments of institutional abandonment and more reductive/negative aspects with/into the North’s developmental narrative. From the “Theses” to the Land Law of 1977 | Developmental, Environmental and Institutional practice following the “Theses” publication in 1964 developed quickly along the goal orientated lines set out within them. There were a myriad planning frameworks and capacity focused goals to meet within numerous agricultural and developmental sectors. Within a few years the tidal reclamation sector was aiming for some 300,000 hectares of reclamation, and the forestry and afforestation sector had been set a multitude of output targets (though not intriguingly any targets addressing overall forest cover). However this rush to silvicultural forestry development generated disruptions similar to the industrial chaos created following the temporary incorporation of Great Leap Forward-influenced “transformational” approaches to development at the end of the 1950s, and which required 1960 to be a “year of adjustment.” However, it seems these disruptive and damaging supply issues that beset these different institutional sectors were disregarded and intense stress on increasing economically useful output was still evident on a particularly grand scale during promotion of the ‘Five Great Nature-Remaking Tasks” associated with the First Six-Year Plan 1971-1976? These “Tasks” contributed to the formulation and generation of later targets for the agricultural and forestry sectors during the second Seven-Year Plan of 1978-1984 and thus perpetuated a developmental policy perspective purely driven by output and capacity increase. It is clear however that disruption generated by the need to constantly focus on output required new frameworks in order to contain institutional damage and to better direct developmental goals. Up until now our country has never had a definitive land law. The only important law concerning the land that we have is the Agrarian Reform Law that was introduced immediately after liberation… but there is as yet no land law which covers land development, land conservation and land administration comprehensively. The principal task of the Seven-Year Plan is to further strengthen the economic foundations of socialism and to raise the standard of living of the people still higher by introducing Juche, modern techniques and science into the national economy at a rapid pace. This planning period, so far as the environmental sector is concerned, appears categorically less dramatic and optimistic in output and capacity terms, than earlier phases of the DPRK’s development. [T]he output of chipboards and wood-fiber boards will be increased; and the wood chemical industry will be developed so that comprehensive and effective use is made of timber. When planting trees, you should mobilize factory and office workers, pupils and students, housewives and all the other people living in the province…. The afforestation office and work-teams should be developed well so that they plant large numbers of trees in a mass movement. However, in-spite of the rigors of the planning process a paradigmatic shift occurred not long into this new planning period, and Kim Il-sung’s text “Let us Make Ryanggang Province a Beautiful Paradise” with its assertion that “[F]orests are a priceless wealth of our nation and indispensable for economic construction and the life of the people…” would be among the last to focus on concrete capacity increases within the environmental sector. The Ecological Meaning of the Sixth Party Congress, 1980 | This change of direction was first signalled at the Sixth Party Congress of the Korean Workers’ Party in October 1980, the last such meeting until the seventh Congress in September 2010. The Congress for its part heralded radical change in the governance and institutional structures of the DPRK. Kim Jong-il was appointed to the Politburo, the Korean Workers’ Party Secretariat and the Military Commission, and announced as heir to Kim Il-sung. The Congress also brought to an end the classical approach to centralised planning which had become economically highly disruptive. More specifically, it led to reduction in the perceived importance of the forestry sector as a component of the wider industrial agenda of the DPRK. The 1980s appear with hindsight as the downward curve on the North’s eventual journey to destitution and collapse in the early 1980s , and these paradigms and approaches would have been negated by the rigours of the “Arduous March” anyway. Tracing the DPRK’s Decline from an Ecological Perspective | Such a review, however, is key to grounding our analysis of Sepho and development under Byungjin, as the current process of adaptation and abandonment bears more in common with the era of the early 1980s than of that era of crisis and disaster. What we see in 1980 and 1981 is a new developmental and production approach markedly different from previous approaches no longer focused on the long term, but on yearly production targets. Such an approach potentially avoids the disruptive impact of previous long-term planning approaches/strategies, but at the loss of certain level of utopian or revolutionary urgency. The fulfilment of such goals and strategy might bring about a utopia much less grand in nature, much more incremental in construction, but perhaps achievable. Might this be true in 2013, the abandonment or diminution of utopian and dramatic approaches to the forging of new revolutionary land from the sea in favour of more grounded attempts to rehabilitate underutilised or fallow land, allowing for actual achievement of measurable goals? Sepho and the Byungjin Line. are certainly closely connected in their defensiveness of posture. Byungjin’s commitment to nuclear deterrence is rooted in a narrative of struggle and overcoming, the Sepho Grassland Reclamation Project on the other hand is determined with great effort to rehabilitate under-utilised or abandoned landscapes. These are not the goals of the optimistic or the expansionist, more the agenda of a nation and its institutions bent on localised or regional existence. Sepho serves as an exemplar of utopianism and developmental approaches on a domestic and domesticated scale, a transformational commitment to the achievable and an environmental conception in which landscape becomes the everyday… a landscape of the courtyard. Robert Winstanley-Chesters, “Treasured Swords: Environment Under the Byungjin Line: Part 2: (Re)Construction and the ‘Rural Theses’ of 1964,” Sino-NK, June 21, 2013. Robert Winstanley-Chesters, “Treasured Swords: Environment Under the Byungjin Line: Part 1: Filial Inheritance,” Sino-NK, June 3, 2013. Jong Yong-chol, “Grass Fields Increased,” Rodong Sinmun, June 10, 2013, accessed July 2, 2013. Kim Il-sung,”The Land Law of the Democratic People’s Republic of Korea”, Works 32 (Pyongyang: Foreign Languages Publishing House. 1977). Kim Il-sung, “On the Second Seven Year Plan,” Works 32 (Pyongyang: Foreign Languages Publishing House, 1977). Kim Il-sung, “Let Us Make Ryanggang Province a Beautiful Paradise,” Works 34 (Pyongyang: Foreign Languages Publishing House, 1977). 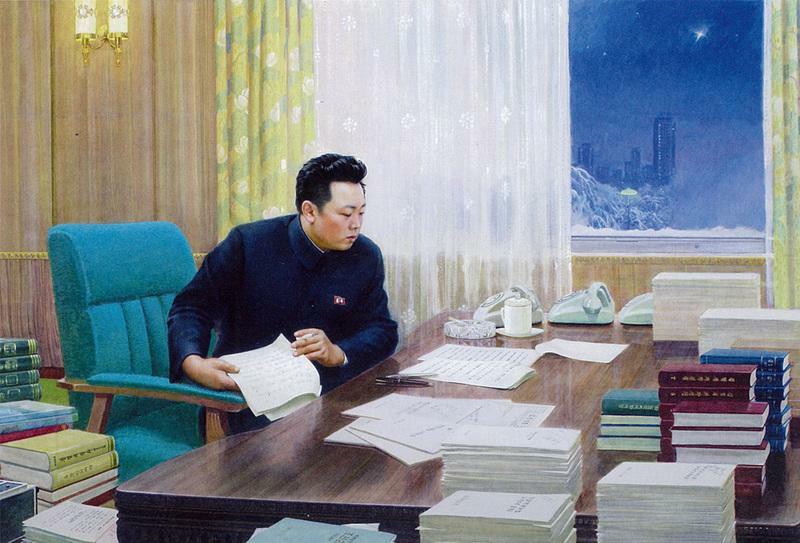 Kim Il-sung,“Speech at The Sixth Party Congress,” Works 35 (Pyongyang, Foreign Languages Publishing House, 1979). Kim Il-sung,“Answers to Questions Raised by the Director of the Research and Planning Department of the Ministry of Information and Propaganda of the People’s Republic of Benin,” Works 36 (Pyongyang Foreign Languages Publishing House, 1981).